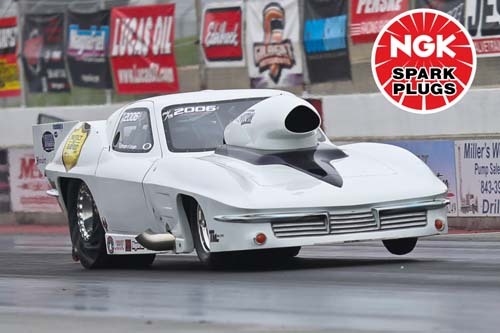 COLUMBIA, S.C. -- Fresh off of a strong season in PDRA Top Sportsman competition, Jamie Fowler announced today that he will race with NGK Spark Plugs as an associate sponsor on the 2019 PDRA Tour. "I'm very honored, excited and humbled all in one," said Fowler. "We're just a small family team, so to be chosen by NGK to help represent their brand in the motorsports world is humbling and we're honored. Not to mention it's a great product on top of that." "We are excited to be affiliated with PnL Motorsports and enthusiastically welcome Jamie to our racing family," said Danielle Orlando, General Marketing Manager, NGK Spark Plugs. "His positive mindset and never-quit attitude is intrinsically aligned with our NGK beliefs and culture. We look forward to supporting Jamie in his drive to pursue his racing dreams." Driving his Tommy Mauney-built, Fulton-powered '63 Corvette, Fowler finished fifth in the PDRA's 2018 MagnaFuel Top Sportsman 32 championship points standings. He attended all but one of the eight races on the PDRA schedule, racing to a semifinal finish at the season-opening East Coast Spring Nationals. The former competitive bodybuilder was also honored with the "Spirit of the PDRA" award at the PDRA Awards Banquet in December. "Last season's results definitely have us excited moving into 2019," Fowler said. "2018 was a huge learning experience for us. We learned a lot about what our car wanted. Moving forward, we now know some things that work and some things that don't work. We feel like we're at a great starting point for 2019. Using everything that we learned last season, we're going to focus on qualifying for Top Sportsman Elite 16 this year." Another one of Fowler's 2018 highlight moments was actually powered by NGK spark plugs. "At the PDRA World Finals, we had gotten ourselves in a bind," Fowler said. "Ryan and Tom Martino, an NGK Spark Plugs-sponsored Top Dragster team, were pitted right beside us. Not only did they give us a set of NGK spark plugs to run so we could finish the World Finals, we also recorded a career-best run (4.180) after we put the plugs in the car. That's something that excites me tremendously: We were introduced to NGK there, we had our best-ever run with the product, and here we are going into 2019 with NGK's support." In addition to the full eight-race PDRA schedule, Fowler and his PnL Motorsports team also plan on attending select Big Dog Shootouts at North Carolina's Piedmont Dragway and GALOT Motorsports Park, and Carolina Xtreme Pro Mod events. Fowler will also race with continued backing from Gopher Utility Services.